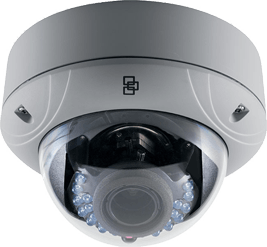 TruVision TVD-1103 is a HD IP Outdoor IR Dome camera is designed to perform in a wide range of lighting conditions. Its built-in IR LEDs provide illumination up to 15 meters to ensure images – even in low light environments. The camera’s Digital Wide Dynamic Range feature ensures that images are obtained, even in back-light scenes. The camera is compliant with the ONVIF and PSIA open standards. Featuring an integrated browser and available micro SD card storage capabilities,TruVision IP cameras simplify remote live monitoring/playback of edge-recorded video and audio. Recording on the memory card also provides a level of redundancy in case of unforeseen network disruptions. TruVision cameras utilize H.264 compression with dual-streaming capability, making it easy to manage the camera’s bandwidth usage. These cameras have been designed to adhere to PSIA and ONVIF open communication standards, and also support a CGI command set for simple integration into any IP system. Video streams can be set up for high and low bandwidth and images can be streamed for live viewing or sent to a designated recording location.